In May, law students were invited to shake off the stress of finals with a prescription of puppy love. Emory Photo/Video. Students stressed out by exams can take a break and play with a pooch on Wednesday, Dec. 12, in the Robert W. Woodruff Library at Emory University. Canine Assistants, a service dog organization in Milton, will bring service dogs in training for two-hour shifts that day from noon to 6 p.m. in the Jones Room, where four "pet stations" will be set up. 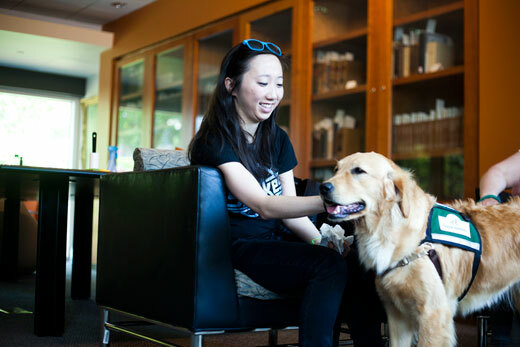 Students, either individually or in pairs, can spend up to 10 minutes petting and playing with a dog to relax and relieve the stress of studying for final exams. "They can pet and play with the dog, rub their bellies, whatever they would like," says Erin Mooney, librarian for first-year students and organizer of the event. 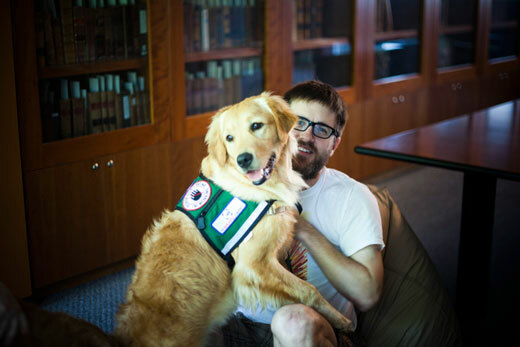 Mooney was inspired to bring the event to the Woodruff Library after Emory's MacMillan Law Library brought in pet therapy dogs during spring finals earlier this year to give students a stress break. 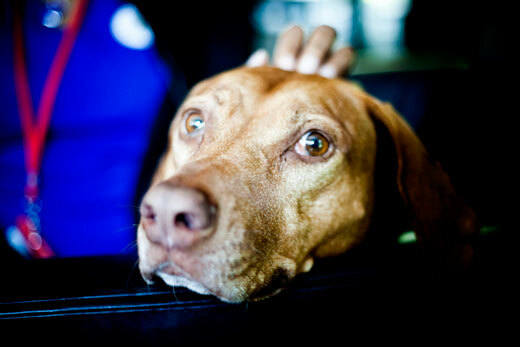 Canine Assistants was one of two organizations to provide dogs for that pet study break, a first for Emory. "All the students who live in the dorms are pet-deprived," Mooney says. "This allows them to have a few minutes to play with a dog. It's something they don't get to experience every day like they might have done when they were at home. "Woodruff Library is known for its spontaneous stress breaks during final exams study periods, which previously have included ice cream (students were alerted by the sound of ice cream-truck music playing over the announcement system), and a Secret Study Break, in which students who found the secret break location in the library within 15 minutes of the announcement were rewarded with free doughnuts. "We haven't had this kind of study break yet," Mooney says. "I'm thinking this will be really good for freshmen who are going through finals for the first time." 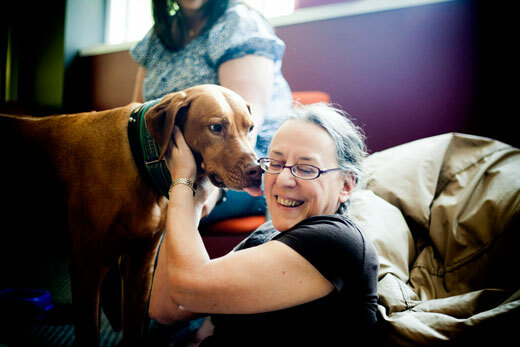 Richelle Reid, assistant law librarian for student services and user experience at MacMillan Law Library, was instrumental in bringing in therapy dogs last spring. She had researched the idea and learned that positive interaction with therapy dogs can reduce anxiety, lower blood pressure, regulate cortisol levels (the stress hormone) and stabilize the heart rate in humans. "It has a positive and even healing effect on the student. It's an opportunity for relaxation, a moment to decompress," Reid says. "And it's a healthier alternative for students to reduce stress, rather than some of the unhealthy habits in which many students engage." 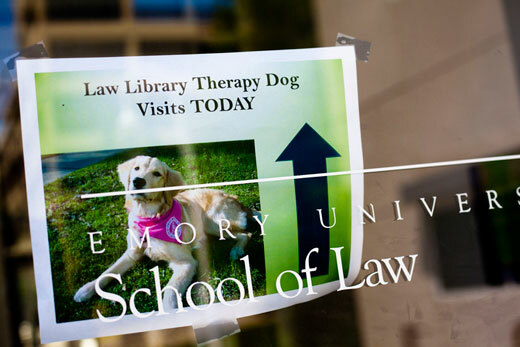 Melissa Loree, director of education for Canine Assistants, says the canine study break event for Emory law students was so well received that the organization is looking forward to returning to campus. Canine Assistants trains service dogs for the physically disabled and seizure response dogs for people who have seizures. 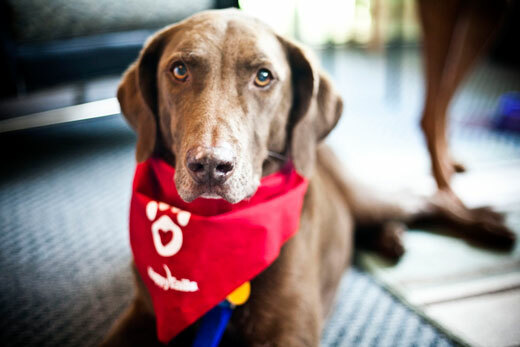 Therapy dogs also visit assisted living facilities, hospitals, special needs classrooms and other settings where human-animal interaction can reduce stress and lift spirits. "This is a wonderful opportunity for us to establish a relationship with Emory and for the students to get to know our dogs, and for us to give back to the community," Loree says.